According to one definition “intention or gross negligence leading to fabrication of the scientific message or a false credit or emphasis given to scientist’’ is known as forgery or misconduct in science. Perspective on Polio Eradication – What is the Issue? Abstract: WHO proclaims polio a social and community health crisis. Global Polio Eradication Initiative (GPEI) was resolved to make world polio-free and had contributed significantly to eradicate polio from 1000 cases per day in 1988 to 8 per year in 2017. Abstract: Background: Hepatitis B and C infections are endemic in Pakistan. The general population has poor knowledge about the HBV vaccine’s availability and the modes of transmission for HBV/HCV. Abstract: Aims and Objectives: To analyze the data regarding etiological and predisposing factors in pediatric burns and make conclusion for prevention of pediatric burns. Abstract: Introduction: The aim of this study was to see the incidence of bedsores in our hospital and determine relating factors. Abstract: Fanconi anemia(FA) is the most common inherited bone marrow failure disorder characterized by cytopenias, somatic defects and increased propensity to develop malignancies. 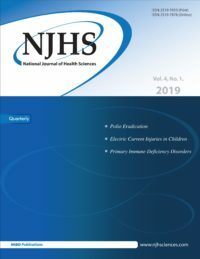 Abstract: CHILD syndrome is a rare X-linked genetic disorder caused by mutation of NSDHL (NADPH steroid dehydrogenase-like protein) at Xq28 gene. The mutation causes the defective synthesis of cholesterol, which is an important constituent of viscera, hormones etc.